Air Show Special: Wings Over… Westmoreland?! The Pittsburgh Air Show has been good and cancelled for awhile now. In 2012 it wasn’t a thing; in 2013 it wasn’t a thing but I didn’t care because thanks to the commemorative air force I was taking a picture. Apparently it was un-cancelled this year, briefly – just long enough to list as maybe a thing on a couple of websites. Then it cancelled itself again and the Latrobe airport in 90-minutes-away Westmoreland county snapped up the headliner. Back when I blogged a lot I got wordy about air shows, and those air shows were things to get wordy about – there were fleets of aircraft. Multiples. A-10s, F-15s, F-16s, F-22s. Plural. DC-3s, C-5s, C-17s, C-130s. B-52s, B-17s. Prowlers. This year there were a total of three aircraft on static display, and they were covered with people the entire time I was present. Two things took the edge off the lack of statics and the sea of bipeds – the macro mode of my SD1400 and a bit of maintenance or throat-clearing on Blue Angel #6. 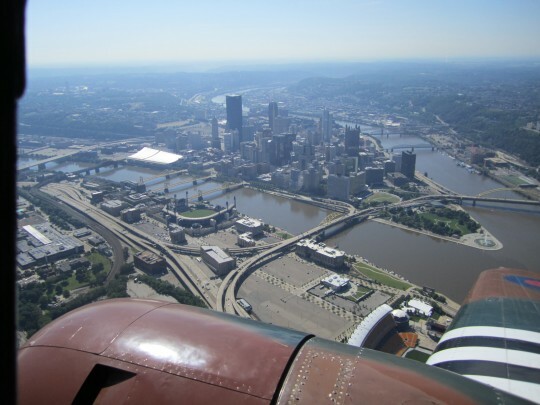 Downtown Pittsburgh from the Commemorative Air Force’s Bucket of Bolts, a 67 year old C-45 Expeditor. 88 queries in 0.857 seconds.